Cactus plants, a little bit about cactus plants, ALL cacti are succulents, but not all succulents are cacti so we deal with succulents in another section. All cacti are from the americas, they ‘generally’ have, Spines, Flowers, No Leaves and they all have Areoles and only cacti have these. Picture right is the interesting species Notocactus rutilans. Cacti, Cactus and specialist succulent nurseries. A resource for lovers of cacti and succulents Australia and world wide. With so many different types of Cactus Plants available for sale it is easy to become a little lost when looking for information on cactus for the home. One thing to look for when buying any plants is a fact sheet outlining individual growing requirements. And when it come to growing from seed, look for comprehensive seed germination note specific to the cactus species you are considering. We can say that many species make wonderful garden plants, and of course many also grow well in pots and containers. In fact container growing both indoors and out is a favoured method of growing in Australia. 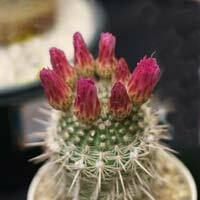 You can browse our individual species pages for pictures of a variety of cactus. A google image search is also worth while for the beginner. Consider joining the Australian Cactus and Succulent Society to gain access to a wealth of knowledge. Basic information on growing cactus relates to potting mix, watering, warmth and light. If these factors are suitable you should have little to no problems with care and propagation. One of the main keys is the choice of potting mix, although cacti grow in a range of soil types they have one factor in common, they are free draining. Proprietary potting mixes are readily available from most good garden centres. Another option is ‘make your own’ . A mix of sandy loam, sharp sand and composted pine bark seems to be a favourite. One of the major problems with cacti, and other potted plants is failure to repot as required. All potting mixes become exhausted after 2 – 3 years, the structure breaks down over time, plants also outgrow pots in time. Repot during dormancy and replace all of the potting mix. ALways water well after repotting. Fertilizer is of course required and although cacti seem to be tough plants they actually do need regular fertilizer. We use liquid seaweed fertilizer during the growing season and a general purpose slow release fertilizer at the beginning if the growing season. The active period of growth for cacti is from spring to summer and this is when watering is important. As a rule of thumb, potting mix should be allowed to almost dry out between watering, overwatering is a major problem. During winter no watering is generally required. Although many species grow well indoors lack of light can inhibit or prevent flowering. So ask your suppliers about particular needs. If you are growing cactus in pots or containers choose a pot that is not much bigger than the rootball of the plant itself. Cactus plants should only be watered when the soil in the pot begins to dry, 10cm of dry soil on the top is a sign, as long as the pot has good drainage. Geelong’s biggest range of cacti and succulents. Trees, palms, ferns, natives, shrubs & perennials.